After the weekend, the petition to potentially expel one Franklin lawmaker is awaiting signatures from elected officials across the state. In an email Monday afternoon, state GOP Caucus chairman Glen Casada sent out a message to the House of Representative delegation about where they could sign a petition to potentially expel two of its own. Legislators have until Aug. 15 to sign in-person. At least a two-thirds majority is needed for a special-called session to happen. It costs the state $25,000 per day to have hold a special session. 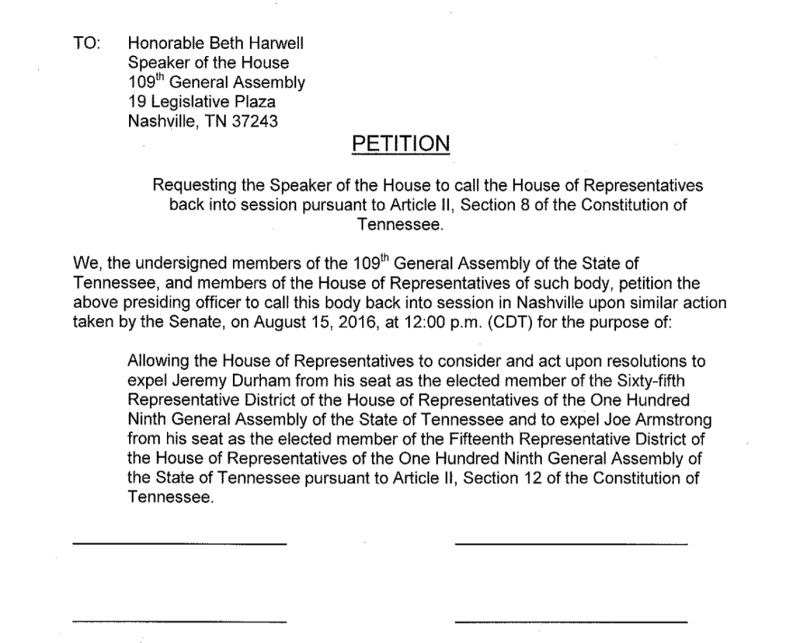 State House Speaker Beth Harwell drafted a statement Thursday afternoon, saying she supported Casada (R-Thompson’s Station) and House Majority Leader Gerald McCormick’s (R-Chattanooga) call to have a special-called session to expel not only Durham but Joe Armstrong (D-Knoxville). On Wednesday, House Democrat Mike Stewart (D-Nashville) pushed for Republicans to reconsider a special session saying Durham would keep his lifetime pension if he remained in office until November. Armstrong is under fire for a federal indictment. Durham has been under continued scrutiny since a Special Ad Hoc committee voted for the release of a report that detailed inappropriate behavior from the incumbent for House District 65, which had pages worth of allegations from female legislators, lobbyists and interns, including examples of inappropriate text messages, offering an under-age intern alcohol and inappropriate sexual conduct in his office in the legislature. Durham is nearing his four-year mark in office, meaning he would receive $4,000 a year in pension funds from the state if he remains in office serving his full term. Casada said last week some legislators didn’t realize it, changing some minds to have a special-called session before the election. Durham, currently up for re-election, will face Sam Whitson on the ballot. The winner of that will face Holly McCall in November. “Just as Rep. Durham lied to me and betrayed the trust of this Caucus with his actions, it is plain to see that Rep. Armstrong has also betrayed our trust as a legislative body and used his public office for personal gain,” Casada wrote to legislators. Casada said he hoped Democrats would hold themselves to the same standards they have asked of Republicans in recent days when it came to Durham’s actions.